You may notice the voting system looks a little different, it's currently undergoing a redesign. Right now it's showing the counts for upvotes and downvotes individually. In a few days we're moving to a new type of system, with 2 options to vote positively towards something -- either as "insightful" or as "funny". 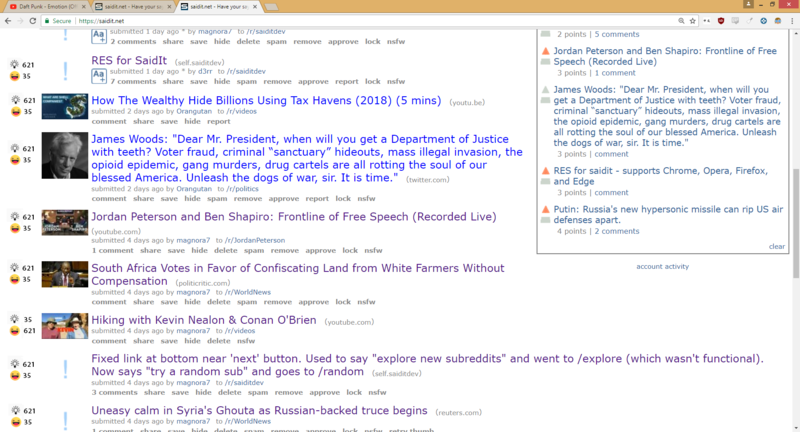 This will allow for the site and comments to be sorted by serious or funny, allowing a new way to filter through the information. We think this will also help preserve the serious content from being drowned out by the funny content, as happened at reddit. It's a system that's worked well for other sites like slashdot to preserve good quality and a good atmosphere where all types of conversations are valued. We look forward to finishing up the changes here over the next week and getting saidit on to the new voting system! Good luck! Sounds ambitious, I'd love if our sites could cooperate instead of compete. Be sure to drop me a link when the time comes! It sounds like a very interesting project.